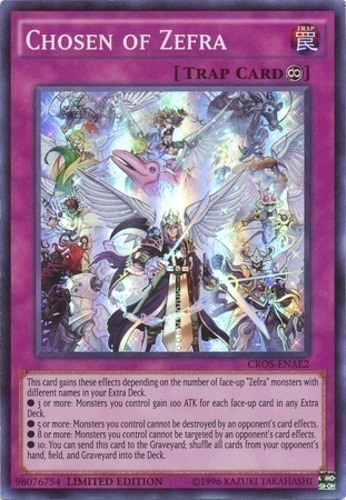 This card gains these effects depending on the number of face-up "Zefra" monsters with different names in your Extra Deck. ● 3 or more: Monsters you control gain 100 ATK for each face-up monster in any Extra Deck. ● 5 or more: Monsters you control cannot be destroyed by an opponent's card effects. ● 8 or more: Monsters you control cannot be targeted by an opponent's card effects. ● 10: You can send this card to the Graveyard; shuffle all cards from your opponent's hand, field, and Graveyard into the Deck.